Well, I could have used this card yesterday as a warning about that speeding ticket! Justice is one of the Major Arcana cards. There are 22 Major Arcana – which act as “trump cards” over the rest of the deck, and chronologically, they tell the story of The Fool’s Journey. They are “phases” we all go through repeatedly, or what I like to call “checkpoints” on our personal road map. Click here to read the story of The Fool’s Journey from LearnTarot.com. Eventually, I’ll be writing my own version, but for now I’ll reference what I know. Justice is all about fairness, balance, and right actions. It has everything to do with law, order, the legal system, lawyers, courtrooms, police – and every other association with Justice one can think of. Justice; equality; being fair; court cases or legal proceedings; finding reasonable solutions to difficulties; impartial judgments. *Astrological association: Libra. With Libra being the associated astrological sign, that puts this card in the realm of East, the element of Air, the season of Autumn, and the suit of swords. 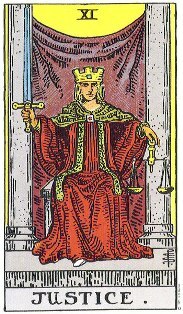 Notice that the person in this card holds the scales of justice in one hand, and a sword in the other. Interestingly enough, in the 22 Major Arcana Cards, Justice follows the Wheel of Fortune! (See this morning’s Coffee Thoughts and July’s Tarot reading to see why that’s relavent to me right now). Sometimes Justice is a signal to do what needs to be done. A time comes when responsibilities must be accepted, and accounts settled. The past will continue to haunt you if you do not recognize your mistakes and make amends for them. You will need to weigh matters carefully and perhaps make important decisions about your future course. On Card 11 we see the familiar figure of Justice. She has the scales of equality and impartial judgment in one hand, and the sword of decision in the other. In the tarot, Justice represents the understanding that life is ultimately fair and just. Even though the vagaries of day-to-day life tend to make us doubt this fact, Justice reminds us that there is divine balance. Notice the similarity between the Emperor and Justice. Both cards stand for universal order; the Emperor in its underlying structure, Justice, in the action of karma – cause and effect. There is a serious feel to Card 11 – the tone of the courtroom. This card refers to legal matters of all kinds, but is not restricted to them. The courts are where judgments are made and decisions rendered. Our legal system is the official arena in which we explore the principles of Justice – fairness, impartiality and the quest for truth. In readings, Justice often appears when you are concerned with doing what is right or making sure you receive your due. This card can also appear when you are feeling the impact of a past mistake or good deed. The cause you set in motion at one time is now returning to you as an effect. The Justice figure seated or standing, scales in one hand (usually left), upraised sword in the other hand. Sometimes blindfolded. The Fool is looking for a new path, a new aspiration and inspiration for his life. Sitting uncertain at a cross-roads, he notices a blind wise woman listening to two brothers argue over an inheritance. They have come to her for judgement. One brother has the whole inheritance, the other has nothing. “I ask that all of it be given to me,” the poor brother demands, “Not only because I have a better right to it, but because I will not be wasteful with it, as he is!” But the rich brother protests, “It is rightfully mine and that’s all that should matter, not what I do with it!” The woman listens, then awards half of the rich brother’s inheritance to the poor brother. The Fool thinks this only fair, but neither brother is happy. The rich one hates losing half his wealth, and the poor one feels he ought to have gotten all. The Fool thinks on this, and new insight on his own life comes to mind. He realizes that he has spent his life achieving worldly ambitions, physical goods, while leaving his spiritual self to starve, primarily because he didn’t want to make the sacrifices necessary to feed his spiritual self. Now, he sees that this is necessary, the only path he has not walked, one he must walk to regain his equilibrium. Thanking the woman, he heads out with new purpose. It is time to balance his own inner scales. With Libra as its ruling sign, Justice is about cold, objective balance through reason or natural force. This is the card that tells the Querent that they can’t keep smoking and drinking without consequences to their health. It is the card that advises cutting out waste and insists that the Querent make adjustments, do whatever is necessary to bring things back into balance: physically, emotionally, socially, spiritually. In a more mundane sense, this card may signal a court case, legal documents, adjustments in a marriage or partnership. The outcome of all of these may not be exactly what the Querent wants, but it will be a scrupulously fair outcome. If the card is reversed, it can indicate bias, obstruction of the law, or legal complications. One thing to remember about the Justice card is that it is not about punishment, good, bad, right or wrong. It is about adjustment. The sword suggests that sometimes this won’t be pleasant. Justice pares things down with that sword so that the scales end up equal. The message is to do what’s necessary, no matter how hard, how disagreeable, in order to gain, or re-gain equilibrium. It is not a nice card, but in its way, it is a very wise card.